Sore gums, red-hot cheeks and chewing more than usual are just a few signs of teething. Many parents look forward to their child developing their first teeth, but teething can cause a lot of pain and discomfort. Safe and fun way to help your child go through the teething phase are teething rings. And they are super easy to make too. 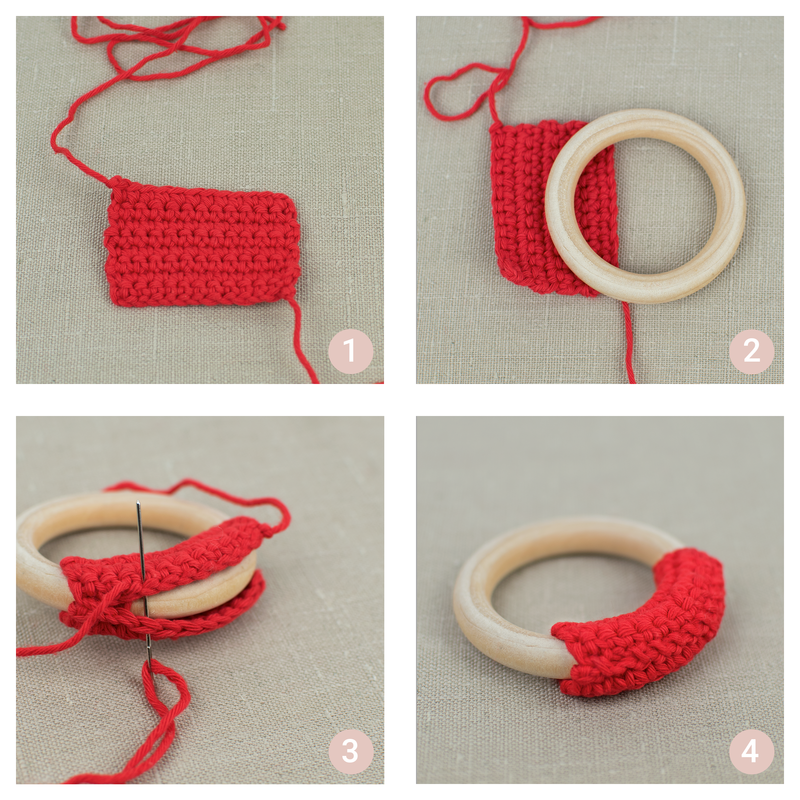 Today I am going to show you how to make a very simple, easy to hold and an inexpensive crochet baby teething ring. It’s beginner friendly and can be made from start to finish in just two hours or even less, for more skilled crocheters. YARN: For this pattern, I was using some 100% Aran weight yarn from Paintbox Yarns Collection. It’s cotton, the strand is nicely twisted around, so it’s super easy to work with and it comes in a great variety of colors. (Shop for yarn HERE!) I used red and beige. I would also recommend Rico Creative Cotton (HERE!). It’s a little bit less expensive version of beautiful colorful cotton yarn, the color pallet is smaller than with Paintbox yarns, but you can still find all the basic colors you might need for your projects. CROCHET HOOK: I was using a 3.5 mm or E/4 simple aluminum crochet hook with a plastic handle (HERE!). OTHER: And of course a yarn needle (HERE! ), stitch markers (HERE! ), a pair of scissors (HERE! ), a wooden ring and a small amount of synthetic stuffing (HERE!). * I bought my wooden rings on Aliexpress. You can find the shop here. They sell supply for baby teething toys; rings, beads, DIY kits and much more. But please check the quality of the products you receive before you gift the toy to a child or start selling them in your online stores! The instructions are written using simple crochet stitches that are because of their long names written as abbreviated words/signs. If there is a stitch or technique that you’re not familiar with, don’t worry, the video tutorials will help you and show you the way how to do it. The wooden ring should be nicely polished, and not varnished or colored. The size of the wooden ring used in this tutorial is 7 cm in diameter. Please clean the toy properly before you give it to a child to play with it. Make sure all the stitches are tight and even. When you work on crochet balls pull each stitch tight, to prevent stuffing coming out of the balls. Please make sure you attach crochet balls to the wooden ring properly. Choking hazard! *The instructions are written as a collection of notes and crochet pattern. I’ve included all the tips and tricks that I’ve learned through trials and errors during making and designing this crochet baby teething ring. 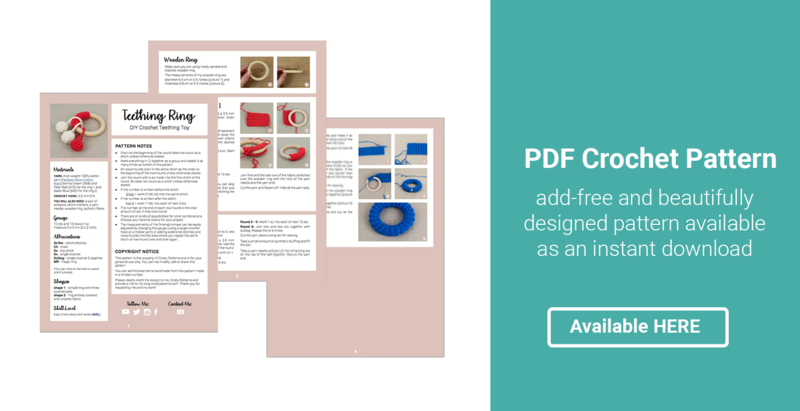 You can get an ad-free, printable PDF pattern from Etsy (HERE! ), Ravelry (HERE!) or Love Crochet (HERE!). You will get a straightforward, easy to understand and follow crochet pattern (instructions) with a bunch of photos and links to the video tutorial if you get stuck along the way. Happy crocheting! 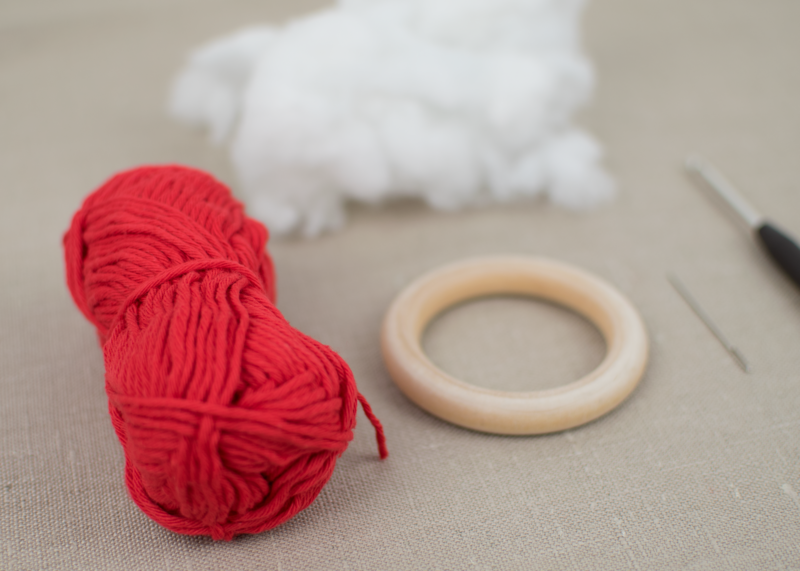 The instructions are divided into three parts or sections: creating a simple fabric that will be later attached to the wooden ring, three crochet balls filled with a synthetic toy stuffing and cord. I will also show you how to assemble all these pieces together to make a finished nicely put together crochet teething ring. I’ve started with the main part which is the piece of fabric attached to the wooden ring. For that, I was using a small amount of red yarn and a 3.5 mm crochet hook. The first step is to make a foundation chain. Mine is 13 chains long. If you would like to cover a larger section of the wooden ring than I did here, add additional chains to your foundation chain to make the base of your crochet fabric bigger. Skip the first chain, the chain that is on your crochet hook and start in the 2nd chain from your crochet hook. Work in rounds. After each round ch 1 (to give the row the proper hight), turn and start in the first one. Row 1: Work 1 sc into each of next 12 chains or as many chains you have, all the way across the row. You can even measure the ring; how much yarn would you need to go all the way around and cover the ring entirely. Row 2: Ch 1. Turn. Work 1 sc into each of next 12 sts. From now on is very simple. Repeat row 2 as many times as you need to cover the ring. So to be able to join both ends of the fabric together. In my case, that would be 5 more times. But if you have a wooden ring that is larger than mine or even smaller, you will have to adopt the number of rows to achieve the desired length of the fabric. Just stretch it around the ring and measure how much you need, and add rows as you go. Leave a long tail, use a yarn needle, place the fabric on the wooden ring and sew both ends of the fabric together. Make sure the fabric is placed on the ring tight enough to prevent it from sliding up and down along the ring. Cut all the ends, wave them in and the main part is now done. I also pushed the seam on the inner side of the ring, just so the fabric on the outer side looks nice and even. It probably won’t stay there for long, but it can be a nice touch when you display the teething ring in your store, when you are taking photos or when you put them into the box and send them away to their new homes. The next step is to create 3 small crochet balls. Mine are filled with a small amount of the synthetic stuffing. You can also use yarn ends, leftovers from some of your previous projects. I would not recommend using wooden balls, beads that you can use for teething Munny necklace parts because the child will play with the teething ring, the balls will dance around the main part and could accidentally hit the child. The balls are made in continuous rounds or also called in a spiral. Here is no need to join each round with a slip stitch, but crocheting around and around creating a spiral shape. This technique makes your rounds a little difficult to count, so I would recommend you to use a stitch marker to indicate your first stitch of each round, to keep track of your rounds. I will start with a magic ring. If you are not familiar with the magic ring technique, jump to this video (HERE!) and learn how to do it. Not convinced this is your favorite way of start working in a round? Don’t worry, create a foundation chain of two chains and start in the second chain from your hook. Work all the sts from round 1 into that chain. Then continue with the pattern as you would normally do. If you started with a magic ring, you know how life changing crochet technique this is. I was putting it away to learn how to do it for a very long time and if I am honest with you guys, it was not the easiest thing to figure out, but once you get a hang of it, you will use it everywhere. Round 1: Work 1 sc into the MR. = 6 sts. Round 2: Work 2 sc into each of next 6 sts. = 12 sts. Round 3 – 5: Work 1 sc into each of next 12 sts. = 12 sts. Round 6: Repeat sc2tog six times. = 6 sts. Now cut the yarn, leave a long tail. Take a small amount of stuffing and start stuffing the ball. When you are done, use a yarn needle and join all the remaining sts together. Weave in all the ends and cut the yarn tail. This is the last step to completing the project and in my opinion the most important one. We will start off by crocheting a simple cord, a chain, that will be later attached to the crochet ball. Make sure all the parts are carefully assembled together and can’t be divided from the man part very easily. Please have in mind that the toy has to be kids friendly. Tell the presents that it’s very important, to check on the toy and the baby if all the parts are still in their place to prevent any accidents. To make a cord; chain 18. Leave a long tail at the beginning and at the end of the chain. Now attach one side of the cord to the crochet ball. The other tail has to go through the middle of the wooden ring first then attach it to the crochet ball. I hope you liked the tutorial. You can find the short version of the pattern with one additional shape in my online shops on Etsy, Ravelry and Love Crochet. I made one of these for my baby cousin. Its so cute in her little hands. Just one thing I did differently I chained 18 before I closed up the ball or cut the yarn. Then I cut the yarn with a long tail and attached the chain 18 down and then I sewed up the hole. This way it’s made up of one part and can’t easily come apart. Thank you again for another amazing pattern!!! This is so cute i was just thinking about making a teething ring and I saw this post! I made one for my little cousin and she loves it! Just one thing I did differently, instead of making the chain 18 a separate piece after I made the ball b4 cutting a tail and sewing it together I chained 18. Then I left a long tail, sewed the chance 18 down and then closed up the whole all with the same strand of yarn so it’s not separate pieces and won’t come apart. Also I put a plastic rattle imsert in one of the balls to make it more exciting for her. Thanks again for another amazing pattern. So easy to follow and quick to make!